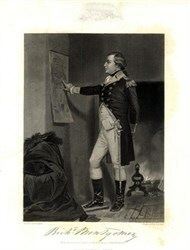 Printed in the 1800's, original engraving (8"x 11") by Johnson, Fry Publishers, New York. This came from the Herzog and Co. / R.M. Smythe archives when they were relocating their offices in Manhattan. This engraving would look terrific framed. Richard Montgomery (December 2, 1738 � December 31, 1775) was an Irish-born soldier who first served in the British Army. He later became a Major General in the Continental Army during the American Revolutionary War and he is most famous for leading the failed 1775 invasion of Canada.